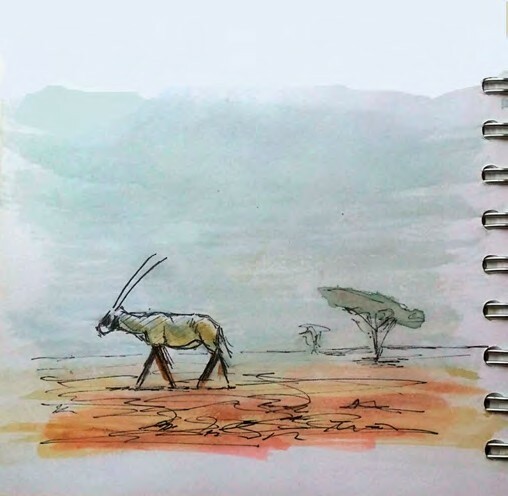 Observe that the coloured oryx on the right-hand page of my field sketchbook actually became one of the more faint animals in the completed painting on page 33. Your reference must inspire, not tie you down. A quick sketch of simple shapes. Once the adventure of a research field expedition is behind you and you have translated the drive and excitement into some sort of useful reasoning, the studio and big empty canvases await. This is my favourite moment. Just back from an expedition to Oman, I am so inspired by the vast array of contrasting environments and all the colour palettes that come with it, how to summarise and apply the left side of the brain? Where do I start? 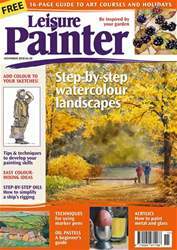 This is a moment to treasure; the ideas taking shape in my head and the big white canvas begging me to splosh paint all over it.